Here in this fine tapestry "Bayeux Mont St Michel", we see Duke William's crew preparing for the Battle of Hastings of 1066. This battle was historic as William becomes the first Norman king of England with his victory over King Harold of England. Here we see Mont St Michel, the famous rocky island in Normandy, France, where Saint-Michel monastery has existed since the 8th century. Here we see the soldiers in their attire including chain mail intricately and accurate reproduced. 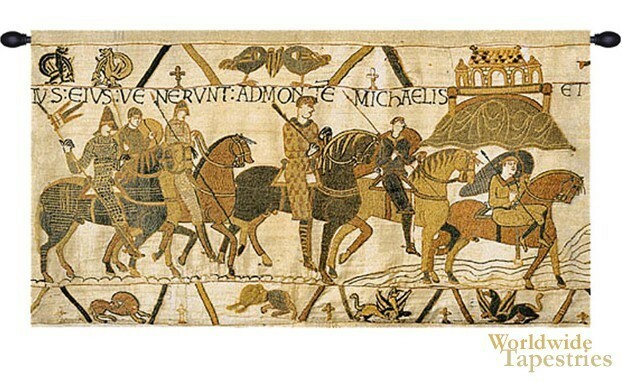 The Bayeux tapestry is an extraordinary historical document that is also a work of art. It reveals the life and culture of the medieval period nearly a thousand years ago in the context of the events surrounding the Battle of Hastings. This tapestry "Bayeux Mont St Michel" is backed with a lining and has a tunnel for easy hanging. Dimensions: W 27" x H 14"
Dimensions: W 32" x H 16"
Dimensions: W 48" x H 26"
Dimensions: W 66" x H 36"